NOTE: The monthly optional "replacement assignment" is available here. Your score on this will replace your lowest non-test score so far. Periods 1-3-4 will take notes as they learn the basics of groundwater. If you were gone, read pages 171-180 and watch this video. Honors students (periods 6-7) will take a test. Attention honors students - The topics for the two level-2 questions on the test will be . . . the earthquake/tsunami of 1700, and radiocarbon dating. 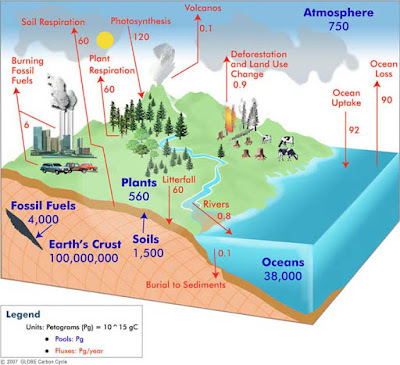 Periods 1-3-4 will review the water cycle and then do a lab activity related to groundwater. If you were gone, read through this Water Cycle Tutorial, read pages 158-161, get the handout, and watch this PowerPoint (goes with handout). Periods 6-7 will take notes on a handout (Groundwater). If you were gone, read 140-150 and watch this video. Period 1-3-4 will take notes as they learn about groundwater issues. Periods 6-7 will review the water cycle and then do a lab activity related to groundwater. Honors students - If you were gone, read through this Water Cycle Tutorial, get the handout, and watch this PowerPoint (goes with handout). . Periods 1-3-4 will do a map activity called (USA Drainage Basins). If you miss the map activity, print out a copy of the packet here, watch the PowerPoint here, and complete the packet. Period 6-7 will take notes as they learn about groundwater issues. NOTE: The monthly optional "replacement assignment" is available here. Your score on this will replace your lowest non-test score so far. Also, if you weren't here to do the epicenter location activities on Thursday (or if you just want a better grade on that), do this Virtual Earthquake Activity. Simply print out your certificate when finished, and give it to Benson by Wednesday. Honors students: The handouts for your projects and papers can be found here. Period 1-3-4 students will take notes on a handout (Earthquake Hazards). Honors students will go over the Dating Deep Blood Kettles WS, the Carbon Cycle Activity, and talk about the projects (or papers), which are due on Friday. Periods 1, 3, 4 will watch a video called "Ultimate Tsunami". Periods 6 and 7 will take notes on a handout (Earthquake Hazards). Periods 1, 3, 4 will take notes as they learn about Montana Earthquakes. If you were gone, get a copy of the handout, copy the notes, and carefully read each of the links below that are marked with an asterisk(*). Periods 6 and 7 will watch "Ultimate Tsunami". Periods 1, 3, 4 will review for the test. Periods 5 and 7 will take notes on a handout (Montana Earthquakes). If you were gone, get a copy of the handout, copy the notes, and carefully read each of the links below that are marked with an asterisk(*). Periods 1, 3, 4 will take a test and then read text pages 171-180. Periods 6 and 7 will review for the test and then set up for Science Circus. We will correct and go over a couple assignments from last week - "WS: Princples of Geology" and "Dating Deep Blood Kettles". If you were gone, watch this short short YouTube video. Honors students - There are no MESPOWs this week, but the Carbon Cycle WS is due Friday. Here is the Carbon Cycle Tutorial and here is the Carbon Cycle Diagram (also shown below). Students will learn about the basics of earthquakes as they take notes on a handout. If you were gone, read chapter 7 - honors read chapter 8. Students will do a group problem-solving activity (Locating Epicenters). If you were gone, go to this website, click on the animation link, and watch it. Then do this Virtual Earthquake Activity - put your answers on your own paper and print out the certificate at the end of the activity. Hand both in. Students will watch a video called "Ultimate Earthquake". Students will watch a video about the Japanese earthquake and tsunami. I you were gone, be sure to watch it here.